The console informs the user with valuable information about the workout and allows the user to control workout resistance levels. 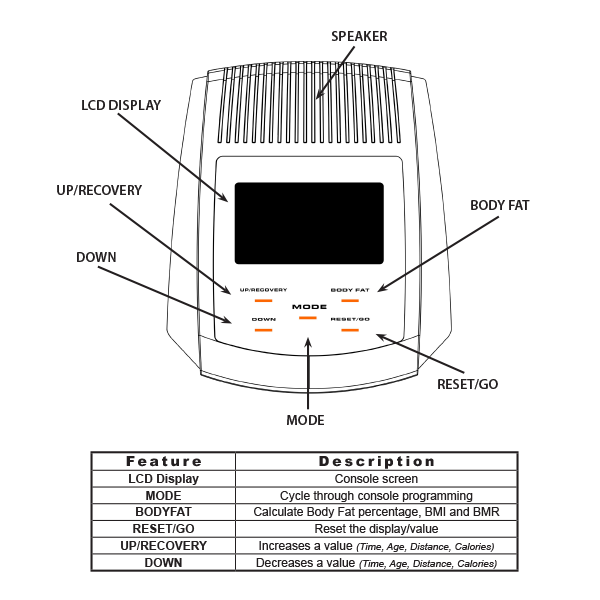 Please become familiar with the console before your first exercise session. The display is able to be programmed to establish customized workout goals. The BFCT1 gives users the power to control their workout time, distance travelled and total calorie loss. The BFCT1 console has the ability to measure a person’s BODYFAT, BMI and BMR. BMI (Body Mass Index) is a statistical measurement of body weight based on a person’s weight and height. Though it does not actually measure the percentage of body fat, it is used to estimate a healthy body weight and used as a diagnostic tool to identify weight problems. BMR (Basal Metabolic Rate) determines your daily calorie needs. The BFCT1 comes equipped with Heart Rate Contacts. The Heart Rate Contacts send your heart rate information to the console for processing. To measure Heart Rate, your hands need to firmly grasp the entire area of the Heart Rate Contact Sensors on both sides of the handlebar. There is no need to hold onto the contacts very tightly although holding onto the contacts loosely may produce a false readout.